G ideon Ariel is on the phone telling someone how his computerized exercise machine made Terry Albritton one of the greatest shot-putters in the world. ..And then we showed him how he was bending his knee, the wrong way. He needed that front leg to be like a solid block for a successful throw. We told him, he did it, and he set a new world record." Later, Ariel sits down at his computer keyboard and, with a virtuoso's touch, taps out a little tune. A stick figure of a shot-putter appears on the black video screen. The figure's front leg is bent. "That's him," says Ariel. "Before we fixed him." Ariel doodles with a control stick and a tiny dot races across the screen to a code-lettered box, then back to Albritton's front leg. Like magic, the knee straightens. Albritton throws again - much further this time. 'See how simple it is," says Ariel as the computer spits out a comparative analysis of both throws. "You straighten a leg here, you drop an arm there, and you make all the difference in the world." All the difference in the world is what Gideon Ariel hopes to accomplish with his Ariel 4000, the world's first "intelligent" exercise machine. With standard "dumb" machines, the person adapts to the system. But the Ariel 4000 "does the thinking for you," says Ariel. "It knows just how much weight you should lift and, if it senses pain, it releases pressure." Chairman of the Biomechanical division of the United States Olympic Committee and a former Olympic discus thrower for Israel, Ariel is best known as the computer wizard who boosted several Olympic athletes to new levels of achievement. and his computer suggested he cut some speed from one sequence of his spin. Race walker Leonard Ansen boosted his speed and endurance by increasing his hip roll and decreasing his arm swing. The U.S. Women's Volleyball Team, in a hopeless 56th place three years ago, placed second in the Los Angeles '84 Games after a year of training with Ariel. Bruce Jenner, Jimmy Connors, Edwin Moses, Jack Nicklaus, and the Dallas Cowboys are among the many professional athletes who credit Ariel with helping them improve performa nce. One of Ariel's latest devotees is President Reagan. 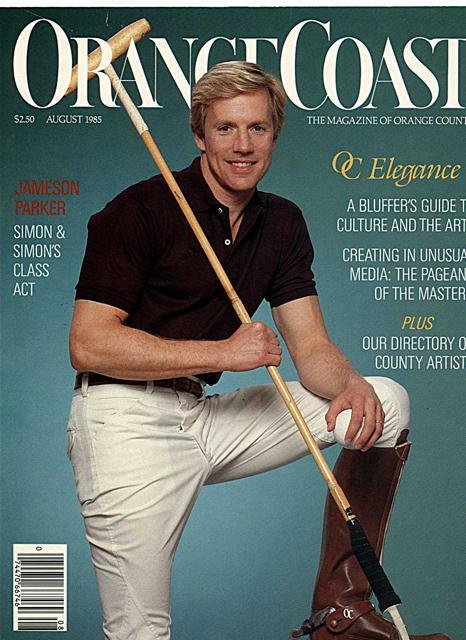 "I saw him sitting on one of my machines on the cover of a magazine," Ariel says with glee. "I didn't even know he had one." With a scientific reputation ranging from "genius" to "The Barnum and Bailey of Sports Science," Ariel is one of the most controversial biomechanical scientists around these days. Exercise experts, such as Dr. Jack Wilmore, former president of the American College of Sports Medicine, believe that Ariel has invented one of the most advanced machines on the market in terms of its capacity to custom-tailor exercise programs to athletes. "An athlete using this machine can't 'fake' a workout," says Wilmore. Others, including Arthur Jones, inventor of the Nautilus, claim Ariel has no scientific proof that his machine is responsible for improving the performance of athletes. "You want to see the best exercise machine in the world?" says Jones. "Go see Gideon Ariel. He invented fire, he invented the wheel." boarding schools following his parents' divorce, the clumsy, overweight problem child longed to bean athlete - any kind of athlete. But all his attempts at school sports failed. "How do they say it? I was always the last one picked for basketball," Ariel says. When Ariel was 17, a new physical education teacher was assigned to his school. He told Ariel that "a big boy like you should be good at something." Discus throwing, perhaps. Ariel decided to give the sport a try, vowing to follow his teacher's advice to practice very hard. "I walked, ate and slept with that discus," laughs Ariel. "I was determined to be a great athlete - even an Olympic athlete - even though the other kids teased me and called me crazy man.' "
Ariel got the last laugh. At age 20, he tried out for the 1960 Israeli Olympic Discus Throwing Team and broke the national record at the trials. At the trials in 1964, he set a world record that still stands. Later, after earning three postdoctoral degrees in exercise and computer science from the University of Wyoming and the University of Massachusetts, Ariel turned his attention to the scientific study of human motion. From a storefront office in Amherst, Massachusetts, Ariel worked nonstop on individual exercise programs, first for muscular dystrophy patients, then for athletes. Word of Ariel's revolutionary research reached Vic Braden, founder of the Vic Braden Tennis Ranch in Coto de Caza. Ariel accepted an invitation to join Braden in the Coto de Caza Research Center, a research and training center for athletes and others interested in physical fitness. P.T. Barnum of Sports Science. from home to athletes bound for the 1984 Olympics. Ariel and Braden were also responsible for having Coto de Caza host the Olympic Penthathlon, an event that gave Ariel's computerized exercise systems worldwide exposure. Ariel's next scheduled stop is the moon. Several astronauts are using the gravity-independent machine to train for their next space voyage, and Ariel would like his Ariel 4000 to be the first exercise machine in orbit. "The machine and its technology are already 'space age,' " says Ariel. "We are probably two generations ahead of- arlything that exists right now. I'm not saying that because I'm the inventor, but because it's true." Ariel based his machine on the concept that timing in sports (the relative speeds of dozens of limb and body segments and the changes in center of gravity) was the major difference between victory and defeat, and that what was needed was an instrument with a quick enough "eye" to record it. The Ariel 4000 is just that - a computer whose electronic brain matched the speed and complexity of human movement. "It took the witchcraft out of training," says Ariel. "Instead of having a coach speculate on what an athlete was doing wrong, we had a computer that could see and analyze every split-second move, and eliminate guesswork." Like any good coach, the Ariel 4000 monitors training and conditioning, pinpoints flaws in technique,"senses" when an athlete is fatigued, and sends him off to the locker room with a curt "Go take a shower!" The computer even has a playful side that produces a Pac-Man-like image that chases and eats a cheesecake. But Ariel says the Ariel 4000, which looks like a Nautilus weight system with a computer and television hook-up, goes beyond what any human coach could do. The machine can analyze the fitness of every joint and muscle in the body and program an infinite variety of workouts. It can sense a weak point in a lift and incorporate miniexercises to build strength at that precise point. And it can measure peak and average force throughout the range of any given movement and provide instant feedback on the screen. With a push of a button, an athlete can chart his progress or compare his performance against that of other athletes. 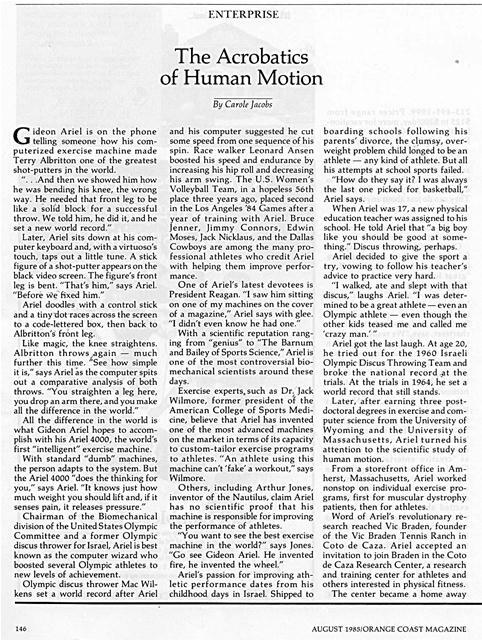 In addition to the Ariel 4000, Ariel has developed a computerized system that turns videotapes of athletes into raw computer data. A computer can then translate the data into a three-dimensional stick figure which can be viewed from any angle. Any single motion - down to the curl of a finger - can bee measured against an "ideal" performance for that particular athlete. "Things like this cannot be seen with the naked eye," Ariel says. "You have to calculate them on the computer. Then it's like playing poker with somebody and knowing what the cards are on the other end." 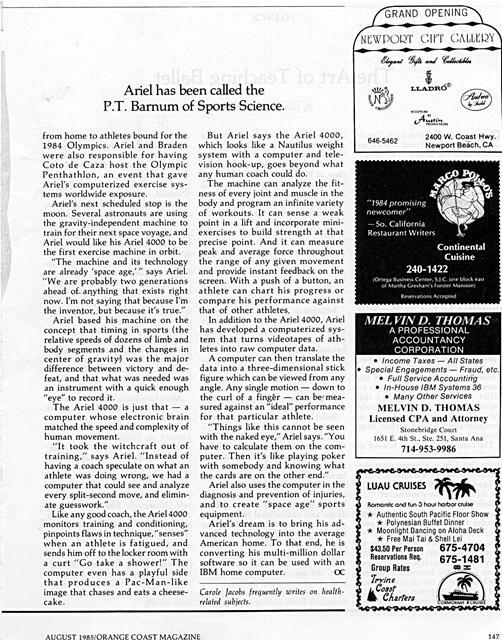 Ariel also uses the computer in the diagnosis and prevention of injuries, and to create "space age" sports equipment. Carole Jacobs frequently writes on healthrelated subjects. ï¿½	Special Engagements - Fraud, etc. Generated on 4/20/2019 3:58:47 PM (PST) ADI/HQ/GBA/2019/ARIELCLOUD/v3.0.2018.0126.